While at Streaming Media West last week, I checked out some new offerings from live streaming service providers Livestream and Ustream. This post focuses on Livesteam, I’ll cover new stuff from Ustream next. 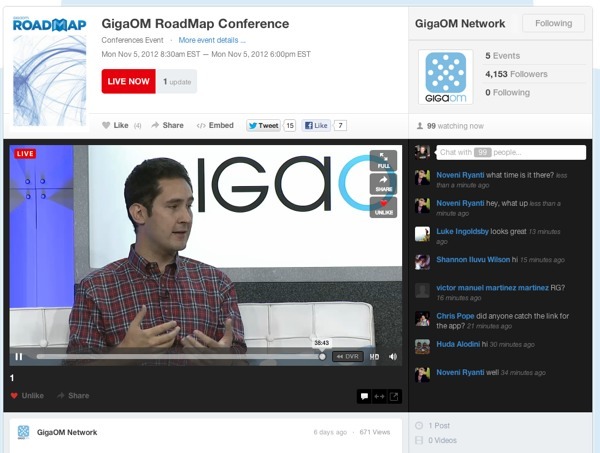 Livestream has evolved considerably over the past few years. Originally called Mogulus, Livestream rebranded itself in 2009 to their current, more memorable name. Earlier this year, Livestream took another evolutionary step with the release of what it calls New Livestream. The big difference between old (or original) and new is focus has switched from the notion of “channel” pages to what they are calling “event” pages. Channel pages were akin to TV channels, in that a producer could broadcast any number of events over time to the same channel. Though one can create multiple channel pages, many producers would set up one channel and call it a day. The New Livestream event page switches focus to a particular scheduled event. The idea being, each event has its own URL that lives on as an archive once an event concludes. Event pages are also much more dynamic than channel pages in that producers and viewers can post text, photos and video updates that flow down the page in a familiar timeline format. The primary event video, whether live or archived, always lives at the top. Another excellent feature that you will find with New Livestream, is DVR functionality built right into the live player. If you look at the screencap above, notice the << DVR icon in the lower right corner. Clicking this allows the viewer to rewind to any point in a live broadcast. Missed the first 5 minutes of a keynote? No problem, just scrub the slider back 5 minutes and you’re watching it from the beginning before the talk has concluded. Pricing has also changed with New Livestream. No longer is ad-free broadcasting based on the number of viewer hours. You can now use New Livestream totally free, without ads being inserted into your content and for unlimited amounts of time in HD. That’s a pretty sweet deal. Anyone who has ever watched any amount of streaming will know how annoying and irrelevant pre-roll and mid-roll video ads are. The caveat with free is that your viewers are required to register with Livestream (also free) before watching. For $49/month they do away with that requirement, as well as give you unlimited archiving and Google Analytics integration. For $399/month, you can embed your event channel on your own site. That might seem steep, but it’s not out of line with what old Livestream used to cost for ad-free viewing with a 3000 viewer hour cap. No viewership caps on the New Livestream. The other nice thing about the New Livestream is seamless integration with their Livestream Broadcaster product. This iconic red camera-top device, created in partnership with Teradek, allows a producer to encode and stream directly to their event page without the need of a computer. If you’re doing a single camera shoot with an HDMI compatible camera, this is a pretty sweet way to go. The Broadcaster can stream over ethernet, wifi or a single 4G cellular modem. Just select the bitrate profile you want from the menu UI and you’re ready to go. The newest and probably coolest thing that Livestream has added to their aresenal, is the Livestream Studio HD500 production switcher. If you’ve ever used a Newtek TriCaster before, you’ll be familiar with what this box does. It’s essentially a portable, five SDI input, HD, digital switcher and encoder. It’s positioned to compete nicely with Newtek’s TriCaster 450. The HD500 hardware is your basic Intel i7 Quad Core processor based Windows 7 machine with a Blackmagic Design DeckLink Quad video capture card and LCD monitor integrated into a luggable design. It does most of what you’d expect from a Tricaster; transitions, DVR playback, stills, titles, lower thirds and assignable audio sources. 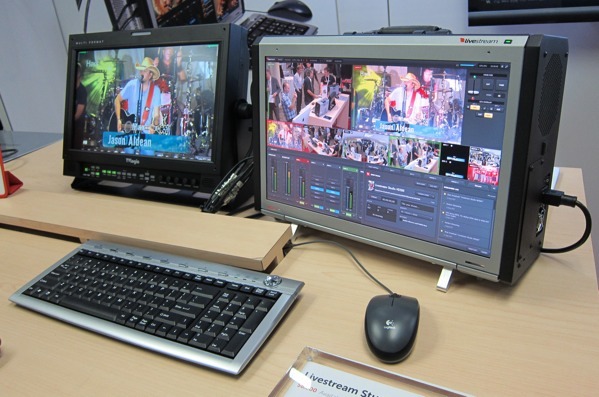 The encoding and streaming piece is handled by Livestream’s integrated Procaster software, with support for multi-bitrate streams. Max Haot, Livestream’s CEO, told me they’d be releasing a software only version of the HD500 in the first quarter of 2013. I asked Max what the impetus for this is and he answered that they wanted to get this into as many hands as possible. The software version will be free for use with Livestream and a paid unlocked version will also be available that can be used with any streaming provider or CDN. Taking a cue from Apple, Livestream is clearly moving towards an ecosystem approach, owning each critical piece of the live streaming experience. At the same time, they don’t require that a producer use any of their software or hardware, but doing so can certainly eases the pain while maximizing the gain.